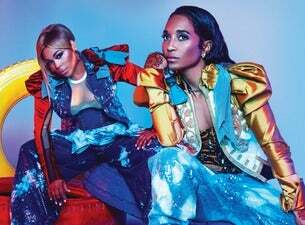 TLC are an American girl group formed in 1991, whose original line-up consisted of Tionne 'T-Boz' Watkins, Lisa 'Left Eye' Lopes and Rozonda 'Chilli' Thomas. The group saw huge success during the 1990s and early 2000s, scoring nine Top 10 hits on the Billboard Hot 100, including four No.1 singles with Creep, Waterfalls, No Scrubs and Unpretty. They recorded four multi-platinum albums during this time too, including CrazySexyCool (1994), which still remains the only album by a female group to receive a diamond certification from the Recording Industry Association of America (RIAA). From there, their accolades come thick and fast: with over 65 million records sales worldwide, they are the bestselling American girl group in history, second worldwide only to the Spice Girls; VH1 ranked them as the greatest female group ever, placing them at No.12 on their list of 100 Greatest Women in Music; Billboard magazine have ranked them as one of the greatest musical trios, as well as the seventh most successful acts of the 1990s; they've won four career Grammy Awards, five MTV Video Music Awards and five Soul Train Music Awards. Following Left Eye's death in 2002, T-Boz and Chilli continued as a duo. In June this year they released their latest album, TLC.